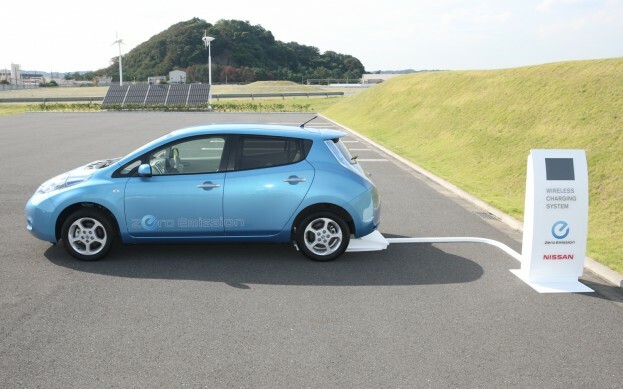 A wireless charging system will be available for the Nissan Leaf from 2013. The system can be installed at either a private dwelling or in a public parking space and it does not impact on the Leaf's full recharge time of eight hours. The wireless system will require some modifications to the Leaf, however, and will not be available as a retro-fit. It requires a revision to the battery software and some pads to be installed underneath the car. To operate the system, a driver simply drives over the charging system installed into the floor of the space. The system then detects the car's presence and the charge can be programmed and commenced using a smartphone app. Nissan has said the system is not affected by adverse weather conditions and can be installed uncovered outside.